In a saucepan pour the milk with sugar, cinnamon and star anise and cook until boiling. Strain and let cool. Then, mix the milk with bread. Add the eggs and the remaining ingredients . Pour the caramel mixture into a mold and bake for an hour bath. Let cool, unmold and decorate to your liking. 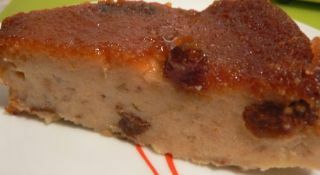 Recipe sent by Marilyn, Puerto Rico. Enjoy!!! Especially if you have a Budin 2 recipe.